Judge golly, a road of old Dhaka was in dilapidated situation for all most five years. Instead of permanently repairing, the authority sometime place cobblestone on the dig. On March 16, the road repair work was inaugurated by unveiling foundation plaque. The vehicular movement being stopped instantly but the actual work starts after three weeks of inauguration. Three months and eight days has already been elapsed but the road did not turn up till Friday. Locals are suffering for suspension of communication. They only want to know when the road may open. Locals said, after unveiling inaugural name plaque, it was impossible to walk in this road. The work stars after one month of its inauguration and they dig various holes for sewerage lines. Two months has elapsed after the work. In the end, they start the cement concrete work on June 10 midnight. It has seen in the spot that there has a large dig very adjacent to the name plaque. Some parts of bamboo being placed on the hole. There has a mosque on the road but devotees could not attend the prayers in the mosque. There has a school called “Kathakali” on the road. The students and guardians have to face immense suffering to reach school. 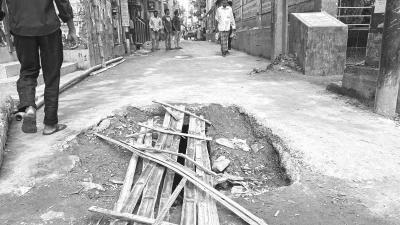 When contacted, executive engineers of local regional office of DSCC Borhan Uddin said, the reparation work of the road has delayed for various reasons. One of the main reasons was unavailability of ready-mix plant for welding. But, the road remains close now for technical reason. It requires keeping close a road even after 21 day of casting. We will open the road after the said time.